WATCH: The new Marks & Spencer's Christmas advert is here..and it's amazing! WATCH: The new Marks & Spencer’s Christmas advert is here..and it’s amazing! With the beginning of the Christmas season just a few weeks away, Marks and Spencer have revealed their Christmas advert. And in the advert, it is the iconic bear Paddington that ends up being the unlikely hero, as ends up saving this year’s Christmas by unwittingly thwarting a bumbling burglar in the new festive advert. The business of Christmas adverts has become more like a war in recent years, and as the cut-throat battle wages on between all the major retailers, Marks & Spencer has certainly got a head start on its competition by managing to sign up the cuddly star ahead of the acclaimed sequel Paddington 2 for its Christmas advert. And in the most barnstorming seasonal marketing campaign yet, the retail chain is set to launch 90 spin-off Paddington products, ranging from exclusive marmalade and chocolate to cuddly toys and duffle coats, as well as absolutely lighting up social media. In a huge get for Marks & Spencer, the ad is voiced by original Paddington and Paddington 2 voice actor Ben Wishaw, as well as being directed by Daniel Kleinman, the brain behind the title sequences of most of the James Bond films since GoldenEye. The 90 second epic, with production value not seen even in a lot of Hollywood films, entitled Paddington and the Christmas Visitor, opens with the children’s icon dreaming of receiving marmalade from Santa for Christmas. But after hearing a thud from the roof, the lovable bear is startled and as he rushes to his bedroom window to see what caused such as loud bang, he opens it and knocks the crook flying, but the innocence of Paddington shines through, as he thinks he has sent Santa flying without his reindeer. Having mistaken the burglar’s red outfit and sack of stolen presents for Santa Clause delivering gifts for families Paddington’s street, the cuddly bear rushes to the hapless burglar’s aid and sifts through the bag of presents with excitement in his voice as he tells the thief, who he still believes to be Santa, that he knows all the children whose names are on the gift tags. The burglar looks on, shocked that his crime spree has come to such an abrupt end, and Paddington tells him: “We’ve got loads more to deliver – let’s take your sleigh,” and after a “giddy up”, Paddington grabs the thief and the pair hop on to a decorative sleigh that has been placed on the roof. They then try to launch off on the decoration with wooden reindeer, as Paddington tries to put the presents back under the Christmas trees in homes from which they were stolen. Paddington calls the burglar – who is played by actor Mark Benton – over to the window as the last present has been returned to its rightful place just before Christmas morning. As the pair look on through the glass, a little girl named Alice excitedly rips through the wrapping paper to find a gift that was on her wishlist – a sparkly superhero’s outfit. And as the heartwarming scenes draw to a close, Paddington reaches into his red hat to pull out a trademark marmalade sandwich which he hands to the teary-eyed crook and wishes him a merry Christmas. It’s enough to warm even the coldest of hearts! Paddington believed he met Santa! As you can imagine, there was some pretty subtle but defiantly noticeable branding going on during the course of this ad. 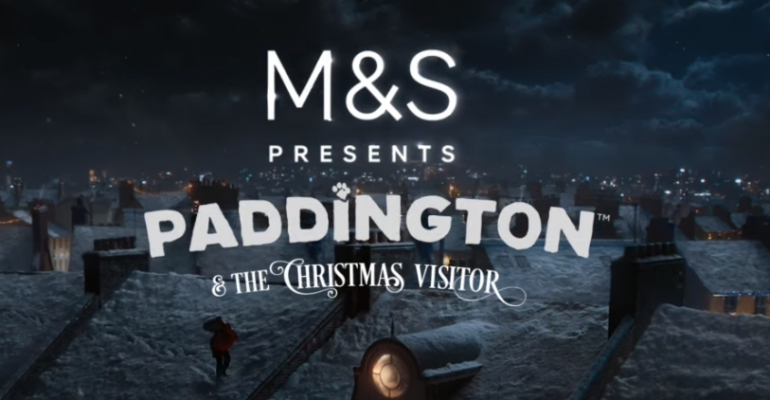 Subtle adverts for brands included stockings hanging by the fireside, with initials M and S on them, as well as trademark mince pies that Paddington stops to wolf down. The advert was filmed over a four month period and used original street and indoor scenes from the upcoming and highly anticipated movie. The ad also ends with a delightful twist as veteran news reader Angela Rippon (who you’ll be seeing a lot of over Christmas, given how many Morecambe and Wise documentaries tend to air), announces some “breaking news” to the nation of how a bear was spotted helping Santa deliver Christmas presents on Christmas Eve.